Steering problems involve the design and geometry of the front end. 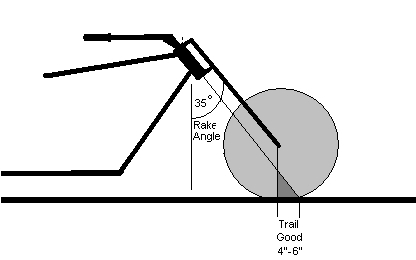 You will often hear the terms "Rake" and "Trail" when reading about bike steering and every builder and rider should understand how these factors affect steering. 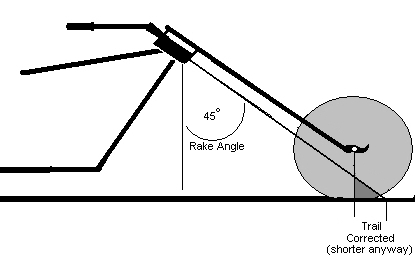 The rake is the angle of your steering neck compared to a line perpendicular to the frame. 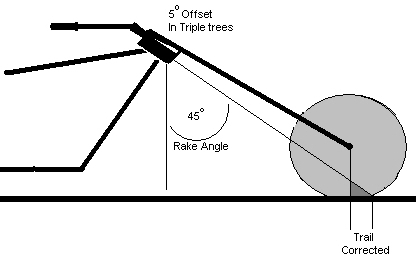 Most choppers have a rake between 34 and 45 degrees. The trail is the distance between a line drawn through the steering neck and a line drawn vertically through the front hub at the axle. I have read various articles on the Internet that indicate trail should be between 2-4 inches and other sites that prescribe 4-6 inches of trail.